Yes, we're moving AGAIN! We finally decided to make a more long-term commitment to living in Cuenca, so we've rented an unfurnished apartment in the hub of El Centro, and we're ready to buy "muebles." Who in the world moves five times in 4 months? We do! Actually, we've been looking and looking for a place we both felt would be fun to paint, decorate, furnish, and make more our home. We both miss our fabulous now-rented home in Oregon. We don't miss the size (over 2,200 sf) and all the work it took to maintain a renovated 100 year old house on an acre of land. We've missed our home - the vibrant colors of our painted walls, the artistic fun pieces we've collected over the years, the coziness we created there, and the comfortable furniture we loved to sink into. Since being here, we've rented four different apartments, none of which we have felt cozy and at home in. This last apartment has been adequate in meeting our daily needs furniture and furnishing-wise, but it's just not home. I'm not sure any place will ever be as wonderful to me as our Oregon home of so many years, but Bo and I know that we can bloom where we're planted and create a home any place if we can splash colorful paint on the walls and find unique and simple artsy decor. So, this next chapter of our journey in Cuenca has begun! Because we knew the exact location we wanted to relocate to (El Centro's Historic District), and because we had a firm grasp on what our budget was for a rental (under $500 all inclusive), it became challenging to find exactly what we were looking for. Also, our desire was to live in an Ecuadorian edificio (building). We had a few acquaintances and new friends helping us look. A call here, an e-mail there and we'd go check out every lead, even if we knew it might be too far from the El Centro Historic District area. Apartment hunting sometimes proved to be tiresome and discouraging, but it was good to see what was out there and to learn the reality of how much things are renting for today (a lot more than some people think who are coming here). We now knew after much searching that adhering to our "musts" would limit our rental choices. This past weekend, we had some friends who have lived in a perfect location of the Historic District for the past two years call us with another lead, which we went to look at immediately. They left the next day for the states for two months and said to us, "Maybe we'll be neighbors when we come back!" thinking we might decide to rent this lead. Bo and I seriously thought about renting it but Bo reminded me and we both agreed, "Unless we have that "WOW" experience, let's stay right where we're at!" We went back the next day to look at this particular rental again and as we were walking towards it, one block away, Bo looked up (he's always looking!) and saw an empty apartment on the third level of a corner edificio with lots of wrap-around windows overlooking the city. It had no "Se Arrienda Departamento" sign on it. I said to Bo, "I don't think that's a rental." Bo's persistence caused me to inquired at a business below, and we were directed to go inquire next door. Sure enough, there was a sign on a door along a side street, and before we knew it we were upstairs, inside, and looking out over the city. Without a vision or the gift of decorating, we wouldn't be able to see the potential of this small but perfect place for us. However, after years and years of making our Oregon home what it is today, we knew, together, we could take this older humble, small, and cozy city apartment and make it ours. My concern for Bo was the city noise. It's on a main cross street where taxis and buses pass by. Bo's concern was for me. It has only one bathroom and it's very tiny (and Bo's very big). We stood together outside on the wrap-around terrace looking at the city lights, and we both knew it was the one. After negotiating with the kind Ecuadorian owners, we accepted, they accepted, and on a handshake (who does this anymore? ), we sealed the deal. They never asked us for a cleaning deposit. They never asked us to sign a lease. They never questioned our integrity, nor we theirs. It was a sweet moment. Their previous renter had lived in this apartment 20 years (he became ill and had to move out to be with family), and the owners wanted longer-term renters there. We were the ones, apparently. Since that "sweet deal" evening, we've paid our April rent (a monthly rental amount we never imagined we'd find or be able to negotiate), we've given our notice at our current apartment (#4), and we're now in the fun and overwhelming process of buying wonderful paint colors (it's all white in there now - not for long! ), hiring our painter (he begins painting Saturday - woo hoo! ), buying our stove and refrigerator (we found some very adequate and inexpensive ones), and looking for our bed (that's tomorrow). I am having a desk custom made, and tomorrow a seamstress is coming to measure and give us a bid for the huge wrap-around windows that need sheer privacy curtains so we can look out and they can't look in (figure that one out!). We can see inside our neighbor's apartments across the street and wave to them. Their curtains are sheets over the windows. Whatever works!!!! Because we arrived in Cuenca with only our clothes and electronics, we have nothing to contribute to an unfurnished place. Imagine, starting all over (exactly what we're doing), like when we were in our 20's and setting up our first household. We will go exploring once again tomorrow, looking at a mattress and bed frame, finding the best places for bathroom and kitchen furnishings, and taking our time day-by-day to make our little apartment a lovely cozy nest. Many would look at this apartment and wonder what we might have seen in it. Few will appreciate what we do see in it. Some might not be able to negotiate four flights of stairs (we like the exercise while we can still climb) nor like the city traffic, bus fumes, and people noise. What's important is that we both LOVE it and have a sense of becoming more planted in Cuenca's Historic District and making this city our home. Buying our appliances was another sweet experience. We shop on an almost daily basis at the mercado (which will now be only one block away from us), and yesterday we stopped by to say hello to one of our favorite vendors. Her husband was there visiting her whom we met for the first time. We told her we were moving and asked her if she knew of a place we could buy "Muebles." Before we knew it, her husband stopped what he was doing and walked us several blocks away to an appliance store that he felt was one of the better and more reasonable places to shop. He introduced us, stayed with us the entire time, and helped us negotiate our deal. It was another sweet moment and memory for us. We are constantly being taken care of by our Ecuadorian friends here. When our place is furnished and ready, we will have this sweet and loving couple over for dinner. When I told her this, she smiled and lit up! I won't be posting any photos of our new place until I've taken our before (tomorrow) and after (who knows when that will be) photos of our place and the decorating process. For now, I wanted to post this so our family, friends, and readers would know why I may not be posting for a couple of weeks. We'll be busy! Since Monday, when we sealed our sweet deal, we haven't stopped. The days fly by and there's much to do. We're both walking hand-in-hand through this new and exciting part of our adventure. The best part for both of us is having a smaller and more humble place to nest in, living in the exact location we wanted, renting from an Ecuadorian family in an all-Ecuadorian building, and paying an absolutely phenomenally low rent that makes us both smile. 1 - LOCATION IS EVERYTHING! Know the exact location you want to live, and then begin looking in that area every day. 2 - LOOK UP! (like Bo did) and you may see an empty place. Don't do like I did and doubt that it could even be a rental. 3 - INQUIRE! Had Bo not insisted that I go inside that business and inquire, we would have missed it. 4 - DON'T WAIT!! If you see something, ACT ON IT NOW!! Our landlord told us that the very next day a woman stopped in to look at the apartment and he informed her she was a day late. Bo's perseverance paid off!!! 5 - DON'T SETTLE!! Persevere and don't settle for something just to move (we did that when we first arrived and it cost us!!). If you settle, you'll miss out on that "WOW" experience and miss out on something better. In the end, it pays to wait! 6 - ASK FOR FREE HELP IN SPANISH!! If you can't speak Spanish, ask a bi-lingual friend who can make that call and help you communicate and negotiate (I've been helping our neighbors, and gladly from my heart). We should be there for each other and not seeing dollar signs for doing someone a service. 7 - HAVE A VISION! Don't look at what the rental is but at what it can become. Be willing to make improvements out of your own pocket if it means making it special. The renters in our Oregon home tell us, "We believe in leaving a rental better than when we received it!" This is what we will do as we make our own special improvements to make this place our home. 8 - KNOW YOUR BUDGET! And stick with it! Don't waste time looking at places that are more than you can comfortably afford. In the end, you'll be glad you stuck with your budget. 9 - NEGOTIATE! Don't settle on the original asking price. You'll be surprised at what deals you may be able to make. If you don't ask, you won't know. Be willing to walk away if it isn't a fair and affordable monthly. 10 - TALK TO PEOPLE! There's something out there for each of us. You just have to keep looking and talking to people. Put it out there to whomever you know and also to whom you don't know!!! I've even asked in stores in the area. Someone always knows someone. Many of these families and store owners are related too. I remember when we first moved here and I saw a sign in Tutto Freddo's. It was a brother of the owner who had a house rental. He came and picked us up and took us to his rental. It was too far, but what a nice visit and ride we had. He took us around the city and gave us a free tour. We were new here, so we appreciated his time and kindness. 11 - DON'T USE AN AGENCY - Because Bo and I didn't go through Craigslist, an agency, or a hired facilitator, we are now going to be paying a rent strictly between us and the owners - a win-win situation for both of us. This rental was made known only from a sign on a door. There are many rental signs out there. I know. One day we called and looked at four apartments in El Centro just from signs in windows. 12 - BE PATIENT! Before you know it, you'll find that place. It may not be perfect, but if you weigh the pros and cons and you can live with the cons, then go for it if it's in the location you want, the price is phenomenal, and you have that "WOW" encounter. Our big con was there was only one tiny bathroom. We can live with this! The greatest of the pros was the location, all the windows, and the amazing rental price. Everything else is an added bonus like not having to pay a deposit, not having to sign a lease, and being able to pay month-to-month. Oh, and NO barking dogs around!!! Our landlord is having the place cleaned spotless including all those windows, he's telling us to paint and make it our home, and he and his wife and family are more kind and loving Ecuadorian people we now know in Cuenca. We're thrilled!! We did it! We found exactly what we wanted (3 bedrooms too!) for a price way below what we ever expected to pay for an El Centro rental, and we couldn't be more pleased. Sometimes I've wanted to run home because I miss the beauty, the grandness, the uniqueness of this amazing Oregon country home that I'd lived in for 39 years before moving to Cuenca. Yet, daily I'm reminded of why I'm here when another kind and wonderful Ecuadorian family or friend stops in to visit us, or when we get together with our ex-pat friends, or when we walk along the city streets and daily run into someone we know and stop and chat. Though our home back in Oregon is grand and beautiful, being here is even grander and more beautiful because of the special people now in our lives, not the stuff we left behind! 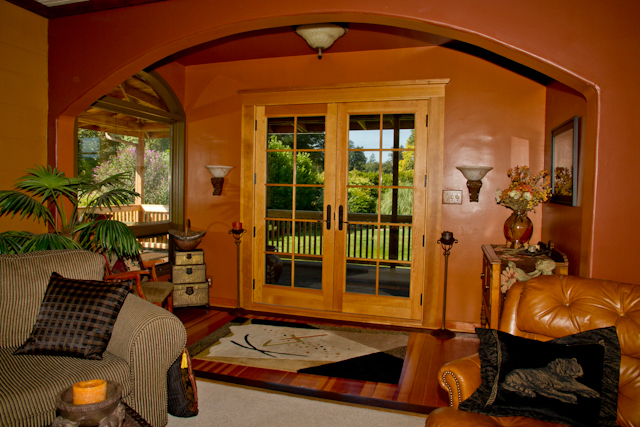 Today Bo and I picked our paint colors - just like these magnificent colors in our Oregon home. Our #5 apartment will be bright and colorful. No, it won't be big and grand and spacious like our country home life in the USA - but we both are embracing the simplicity of this new chapter in our lives and the next phase of this ex-pat adventure - turning a simple and humble Ecuadorian flat into our own special comfortable place. Soon I'll have fun photos to share with our readers. Stay tuned! Bo and I enjoy walking a few blocks from our apartment to sit and have a cup of Cappuccino and visit with our friends, Rumi and Melissa. Cafe de Nucallacta is not like Coffee Tree, where many go to sit, smoke and sip coffee for hours as they visit with other ex-pats and chit-chat. This tiny little hole-in-the-wall place has a few tables and chairs where we love to go to sit and order our delicious coffee drinks, visit with our friends for a while, and then leave. Rumi and Melissa have been open since December, and their organic coffee beans are fresh-roasted every morning for their daily by-the-pound coffee sales. 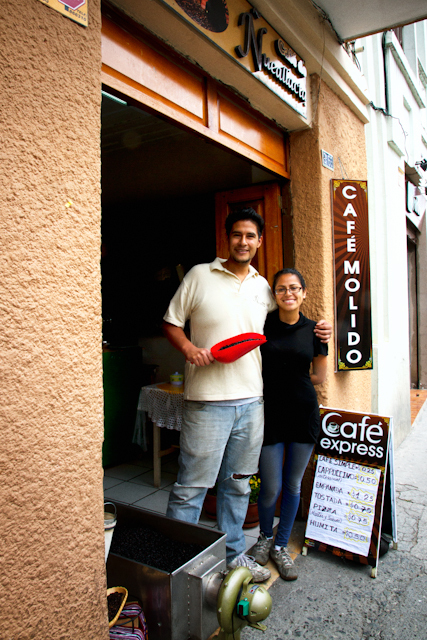 Serving coffee by the cup is simply to introduce great organic coffee to the Ecuadorian community as well as the ex-pats because Rumi's desire is to educate and inform the Cuencano community that freshly roasted and exceptionally great coffee can be experienced and purchased in this excellent coffee-craving but excellent coffee-lacking city. 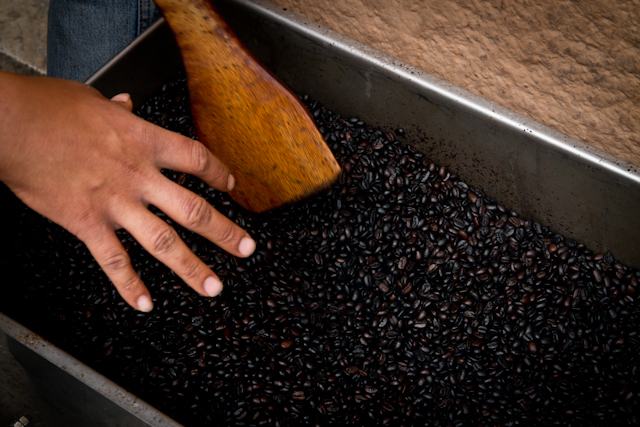 This is the strong roasted variety of beans at Cafe de Nucallacta. Behind the curtain! 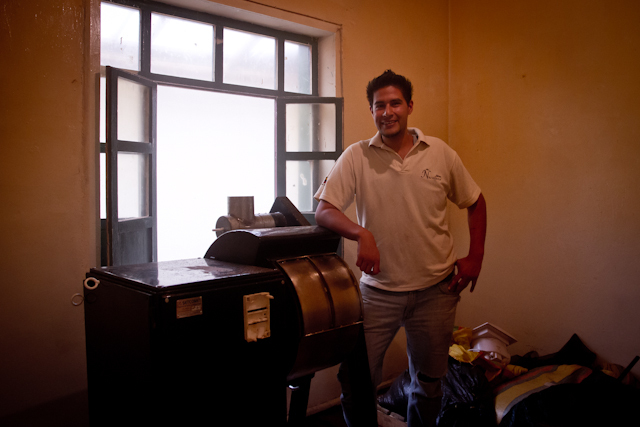 Rumi stands proudly by his roasting machine where he daily roasts fresh organic beans in three different strengths. Let Rumi know what strength of beans and grind you desire, and he is at your service! 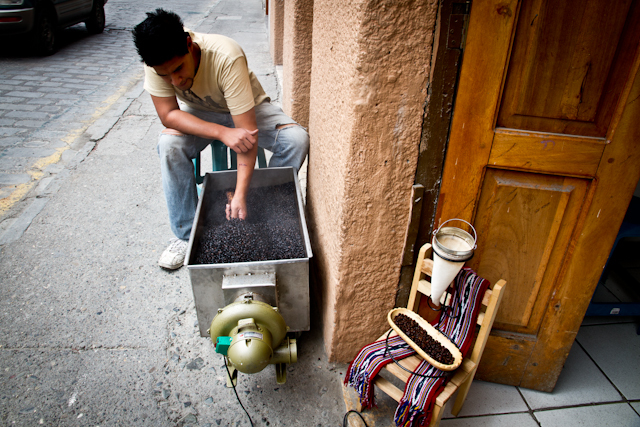 Rumi is hand-sifting through a batch of his freshly roasted dark blend to cool it quickly! Every variety of roasted beans has to be done to perfection, and the dark roast (which Bo and I love!) 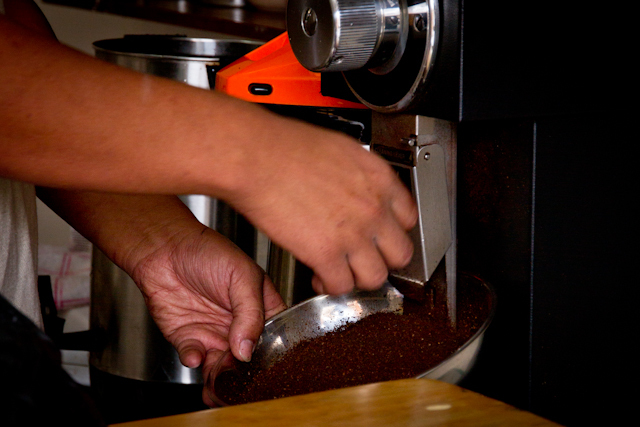 is the more difficult and time-consuming blend requiring special attention. 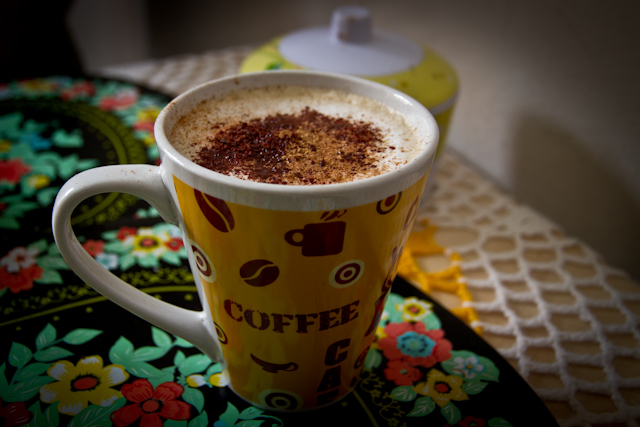 Where in the world do you get a cup of daily freshly roasted cappuccino for 75 cents? Only at Cafe de Nucallacta!!! I'm sure you'll leave there with your freshly roasted one pound bag of beans (tell them Bo and Linda sent you!!). By the way, a pound of whole or ground beans is $3.50. What's not to love about Cuenca?? 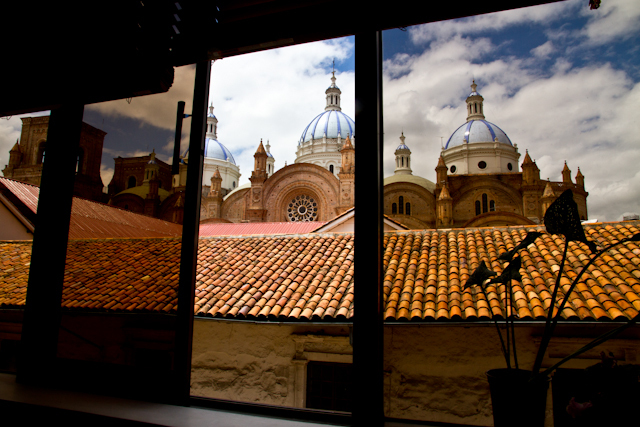 RENTALS IN CUENCA ECUADOR - SIMON BOLIVAR - A View From My Window! My office is in a room with a fabulous view of the old Cathedral. The sounds of a busy city fill my ears while I spend time at my desk each day. Its been almost four months of being El Centro apartment dwellers, and city noise is now so familiar and an almost pleasant sound for me. 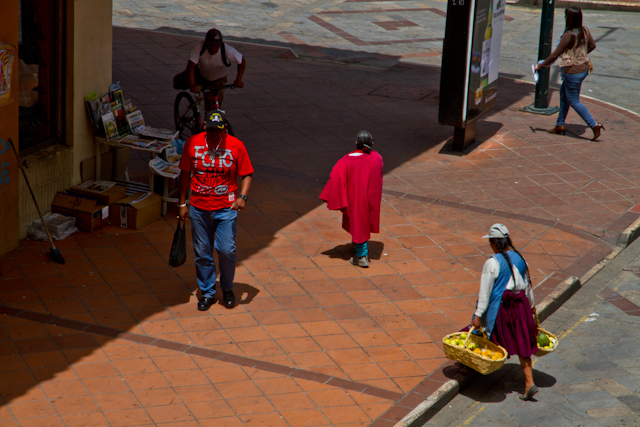 Strange, how after living 39 years in the quiet peacefulness of a country setting, I actually enjoy the extreme contrast of living in a city apartment overlooking one of the main and busy streets of Cuenca - Simon Bolivar. The constant sounds of night traffic rushing by, the continual bleeping of the corner's changing street light, click-clacking heels and rushing steps of passing pedestrians walking beneath my window, Spanish chatter and laughter, yelling vendors, the rare sound of a crying child, and the sudden sound of a triggered car alarm blaring until someone finally deactivates it are a few of the constant noises I listen to as I sit at my desk and wonder why this extremely different lifestyle is so okay with me. Maybe it's a part of the adventure of living here - something completely different than how it used to be back in the states. Living in constant noise vs. living in ultimate peacefulness, walking along streets crowded with passersby vs. walking along solitary country roads, riding taxis and buses vs. having the independence of my own vehicle, Smelling city bus fumes vs. smelling fresh country air, city apartment living vs. a 100+ year old to-die-for country home, paying monthly rent vs. living in a mortgage-free house, Listening to and speaking Spanish more than English vs speaking and hearing familiar English, not working anymore vs. being productive and earning a living, starting all over in unfamiliar territory vs. having 39 years of predictability and a sense of security. Why? I still ask myself, why? Then I answer myself, why not? Why not do something completely different and opposite - something so beyond my wildest imagination and something I couldn't even wrap my mind around when my husband suggested it back in 2009 - expating! Things change! Sometimes not for the better. Health issues suddenly appear. The changing economy destroys security and plans and dreams. Loss of jobs. Aging and living in a rut. Questions about sudden and unexpected changes arise. Some begin to look outside their box and take big risks. Others work things out right where they are - or they don't. Still, things change! They changed for us. Unlike some, we embrace change - but this was big. Am I sorry I'm here living in a city apartment? Not really. 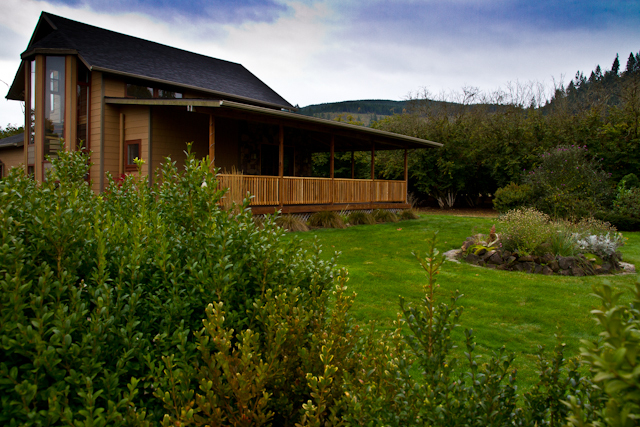 I do miss aspects of my life, my beautiful home, and especially my mom back in Oregon. But, there's so much I don't miss. I ask myself, am I really content here in Cuenca? I can answer honestly, today, yes. Life for me anymore is day by day. I don't know if I'll feel the same in a week, a month, a year, or five. Today, yes I'm content here. It's about the journey - the adventure. There's a big world out there. Cuenca is my world for now. Early, from my upper window, I watch the city waking up and beginning to rush by. I watch the people walking by. 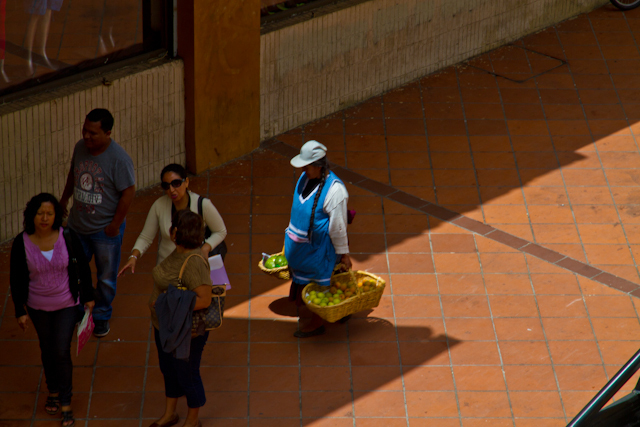 I watch the workers and the vendors doing their daily work to earn their "plata" so they can care for their families and eat. Sometimes I sit on the window sill and just watch. Then I wonder, "Who is that person? Where is he/she going this early in the morning? Where do they live? Who is their family and what is their family life like? Are they content? Is this the rest of their life?" Late at night, I listen from my desk as the city noise gradually subsides the later it gets. Still, there are the occasional sounds of cars driving by, late-night walkers passing by, always the never-ending sound of the corner street light bleeping, and the occasional distant sound of a horn honking. Finally, Cuenca sleeps! I'm thankful that I've had wonderful opportunities in my life, including several out-of-the-ordinary adventures. I count living in Cuenca as another opportunity and adventure and one I'm glad my husband and I both decided to finally do together, in spite of the obstacles, challenges, and doubts we've faced and will continue to experience along the way. We live here now, city dwellers, and each day will add something new to embrace and be thankful for - all a part of life's journey. 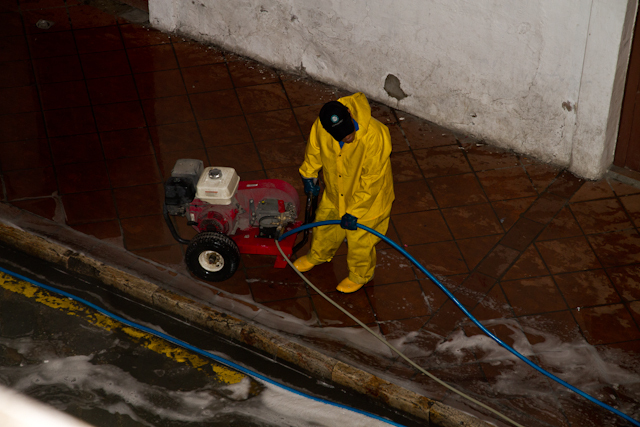 Last night while at my desk, I could hear a loud generator running as the evening street cleaners scrubbed and power washed the city sidewalks below my open window. Was it loud? Very! 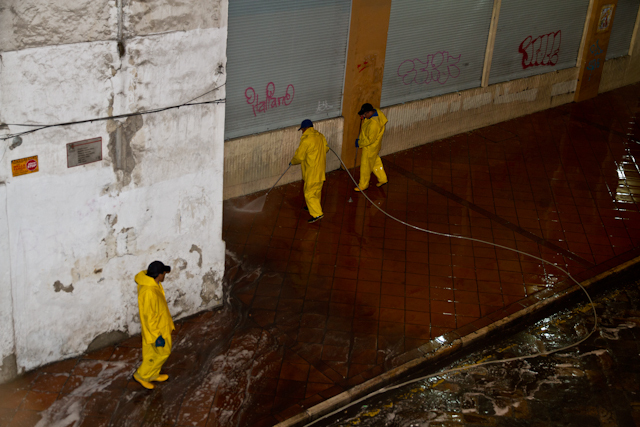 But when I went to the window and poked my head out, I smiled knowing these "yellow men" were working hard to keep my Cuenca city clean. 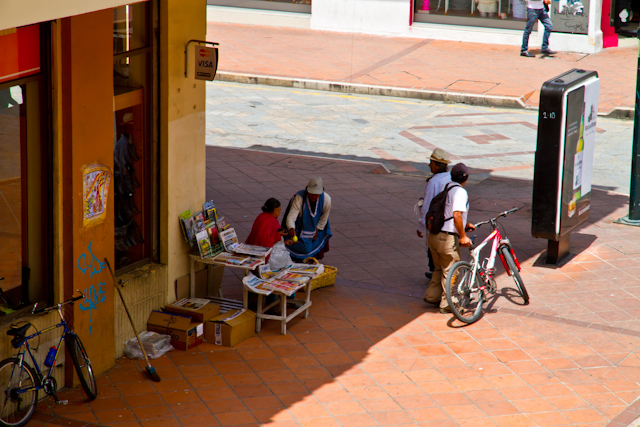 I love watching this corner street vendor from my window. 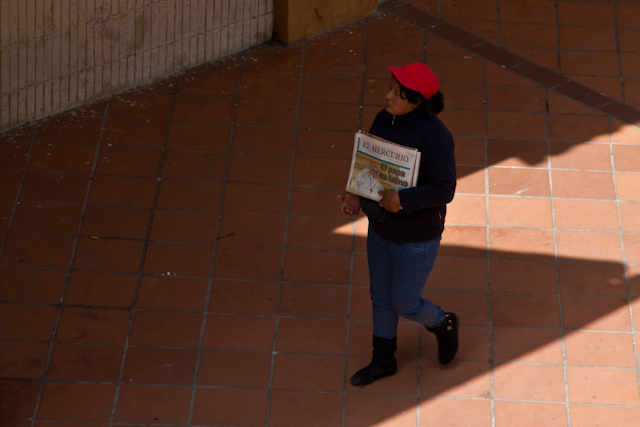 She sits there all bundled up from early morning until late evening selling her magazines and papers. Her location is prime and her sales are constant. This fruit vendor is rushing to her daily spot somewhere along the city streets. ..........her fruit sale is completed and she scurries down the busy street below my window to who knows where! I enjoy living in the heart of El Centro and getting acquainted with new streets, hidden shops, interesting people, hard-working vendors, and embracing the noise and energy each new day brings. Yes. Noisy Busy City Living. It's right for us, today! COST OF PRODUCE IN CUENCA - More on our frugal lifestyle!!! 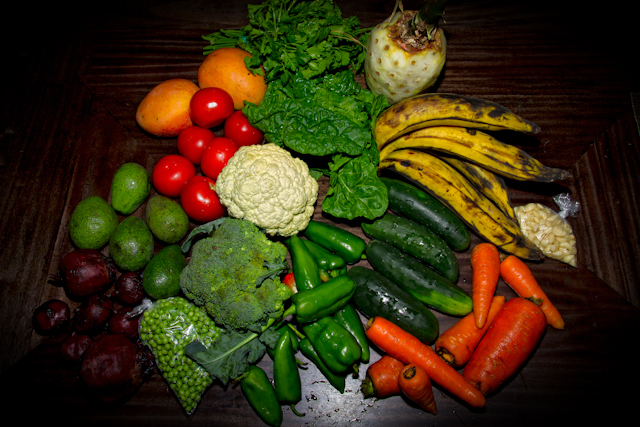 Mango, parsley, chard, pineapple, plantains, garlic, cucumbers, carrots, green peppers, peas, beets, avocados, broccoli, cauliflower, tomatoes. All this for $12 - Really? Yes Really!!! I remember reading different blogs and looking at photos of Cuenca's mercados when Bo and I were planning to relocate here. It was one of the first things I looked forward to doing once we landed - finally, going fresh produce shopping at the various Mercados. Here we are, 3-1/2 months later, still loving our almost daily shopping trips to the wonderful colorful and abundant markets in El Centro, and also shopping from the street vendors along the way. We have our favorite vendors now whom we know by name, and we get lots of special treatment and favor. You can see in the photo that the pineapple is perfectly peeled because one of our favorite vendors takes care of us. Our Ecuadorian families tell us how much more we can get for our money if we would go to Feria Libre (some think we are getting gouged). Soon, we will trek out there for a shopping trip with our friends who will show us the best vendors to buy from (we've been there but not to actually shop). We will do a price comparison to see if it's worth it to save a few dollars. However, for the convenience of being able to walk four to eight blocks to the markets from our apartment, and because it's only the two of us and produce here is fresh and organic and spoils if not eaten quickly, we don't know if it's going to be worth the long trek to Feria Libre and back. We'll see. For now, we enjoy knowing our vendors and feel we are getting a lot for our money. It's also rewarding to frequent and bless our favorite vendors. This is the 9 De Octubre Mercado which is very close to our apartment. It is a very busy, clean, and abundant market that has wonderful meats, seafood, vegetables,and fruits plus food and juice vendors. We sometimes shop here but enjoy the 10 de Augusto Mercado and their vendors more, where we mostly shop since moving to El Centro. It's the 16th of March, and so far we've spent a total of $121 of our $289 food budget in groceries, household, wine, produce and protein (poultry, beef, seafood and shrimp). We've had several dinners at our home with friends. We cook most of our meals and eat in more than we eat out. Our food/household bill for just the two of us back in the USA was between $600 and $800 dollars. We purchased organic meats and produce (so spendy there) and the cost of groceries and household items was so much more. Here, we eat even healthier (we do not buy prepackaged or canned foods) and spend less because we only buy what we need as we run out of that item. Living in the heart of the city prevents us from having to stock up on items because we can walk out our door and find a tienda close by to pick up what we're out of. This, I love about living in El Centro. We recently attended a party where an ex-pat couple shared with us that their monthly grocery bill runs $700 to $800. It's just the two of them, but they say they entertain a lot and shop mostly at SuperMaxi. They also expressed that their monthly living expenses were in the ball park of $3,000 or more a month. I share this because it will become a personal budget for each and everyone coming to live in Cuenca. No one can say how much it is going to cost another person for groceries, housing, transportation, medical, etc. We, ourselves, can live here on less than $1,300 a month because we are purposing to live frugally. It is our desire to eat healthier, live a simpler less costly lifestyle as we continue to learn about and explore this area and culture to see if it truly is where we want to plant ourselves for a long-term commitment. 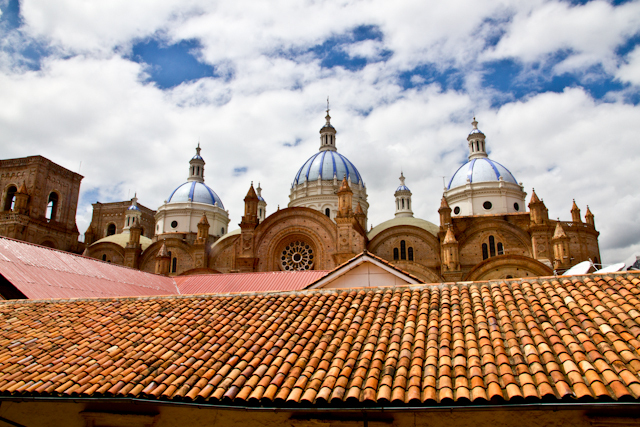 Remember, we did not previously visit Cuenca to know what to expect. We just packed our bags and came! We continue to document our daily spending, to shop daily at the local markets (Yes, we buy our meat and seafood at the open markets, and yes we're still alive and well), and to purpose to stay within our monthly budget. My really fun frugal shopping trip today landed me in a second-hand store (and I read there weren't any to speak of here!!!) where I found 5 pair of fabulous practically new designer jeans, perfect fit (I've lost 10 lbs of ugly fat since being here - woohoo) for guess how much? $28, really? YES REALLY!!! I told you Cuenca has everything one could possibly need! Even a thrift store!! I'm happy and I love Cuenca city life more each day. 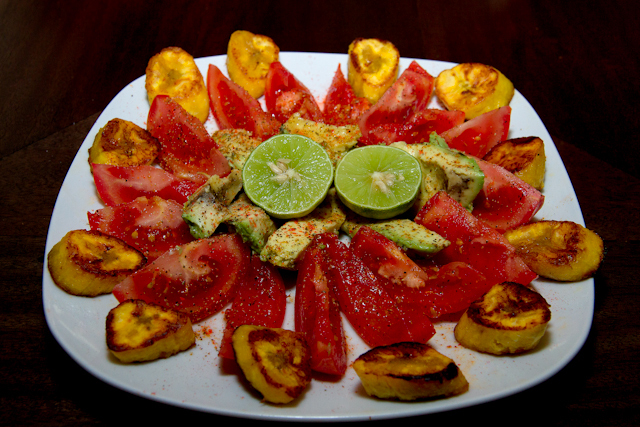 One of Bo's delicious salads we love to munch on - Avocado, Tomatoes, and butter-fried platanos (plantains) - with fresh limon, a drizzle of cold-pressed olive oil, and sea salt. YUM! Walking miles and miles each day and eating mostly Paleo is our choice for a healthy lifestyle. 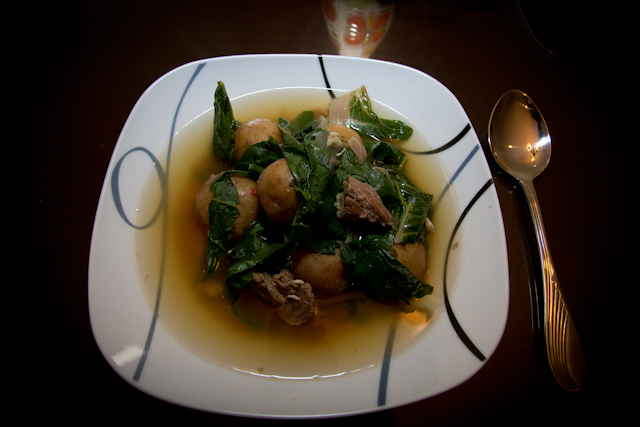 Bo's Beef Bone Broth simmers on our stove daily - and this is one of Bo's bone broth soups - with beef, potatoes, and fresh chard. WE LOVE CREATING DELICIOUS SOUPS! One of the most memorable movies I have ever seen is "The King's Speech." For me, it was a reminder that when one operates in their gift, they can touch any life, from the famous and rich to the unknown and poor, from the untouchable to that one person who wants more than anything what you have to offer, in spite of any fancy degree or qualifying certificate. And, because of your gift and true passion to give, a lifetime friendship can be the most rewarding end result. In the short time we have been living in Cuenca, Ecuador, we are daily reminded that if we are willing to give of our time and talents, we can touch the less fortunate or that one person who wants more than they currently have, and in turn we are the ones who are blessed. I am not an English teacher, nor do I have any credentials that would qualify me worthy of teaching. My husband, however, is a graduate of a NY College with a teaching degree in English. He does have a God-given gift of teaching and also valid qualifying credentials to teach! Today, we attended a twice-weekly Spanish Chat Group which we usually hit and miss because of our daily busy schedule. A few weeks ago, I received and responded to an e-mail sent out by the two organizers of this chat group. 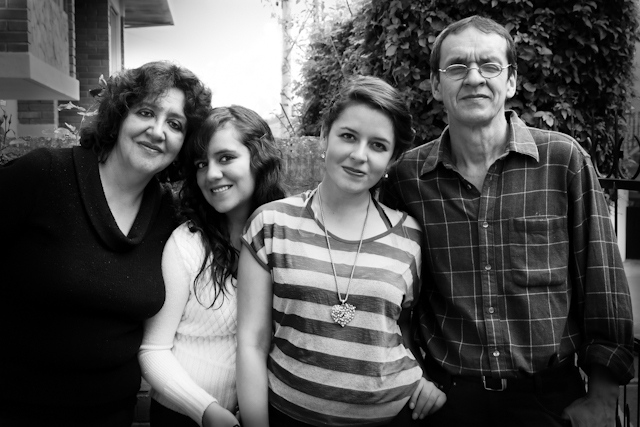 Because of the organizers' e-mail and my quick pro-active response, Bo and I now have another precious Ecuadorian family in our lives and two more hungry Ecuadorian people who attend our weekly "English Classes" held at our home. I remember when we were living in Honduras and several Hondurans we met were hungry to learn English. Bo and I were able to give them English teaching books and had on-going daily conversation to help them along. When we left that country, one of the friends we were blessed to know cried when I gave him my personal bi-lingual Bible and told him that I hoped he would one day speak English fluently. I will never forget that moment because I know that his life was forever changed. Since leaving the USA 14 weeks ago and letting go of all our stuff and the daily rut we were in, all I desire to do here is to somehow make a difference. What is that for me, personally? I can give away what I have to someone who wants it. Do I need a degree or a piece of paper that says I am a teacher? NO! What I do need is the God-ordained gift and ability to do so and to carve out precious time to make it happen. Someone in "Chat" said to me today, "I met an Ecuadorian who really wants to learn Spanish, but I don't have the time....... Can you talk to him?" Another person told me that she has an English teaching certificate but doesn't know how to get things going here to teach English and would I let her know if anyone needed help. There are some Ecuadorians here who truly want to learn English, just as there some ex-pats who truly want to learn Spanish. It takes a desire and a real commitment on both parts to make this happen - a student who has the desire and is committed to learn and a teacher who is gifted and committed to teach. The woman who's e-mail I quickly responded to is an English Teacher in Cuenca, but she doesn't speak fluently and needed help passing two required time-sensitive 4-hour exams in order to keep her current position. She also has another exam in the fall that will be even more critical for her livelihood. Bo and I accompanied her to her home that weekend to support and guide her (not take the test for her), and she passed with a high score and expressed so much gratitude. The following week we helped her with another written and oral exam, which she also proudly passed. Today her family has more than embraced us and thanked us for our help. Mother and one daughter are now attending our weekly English classes at our home, and they have embraced us and we are now a part of their family. This is always the best end-result blessing. 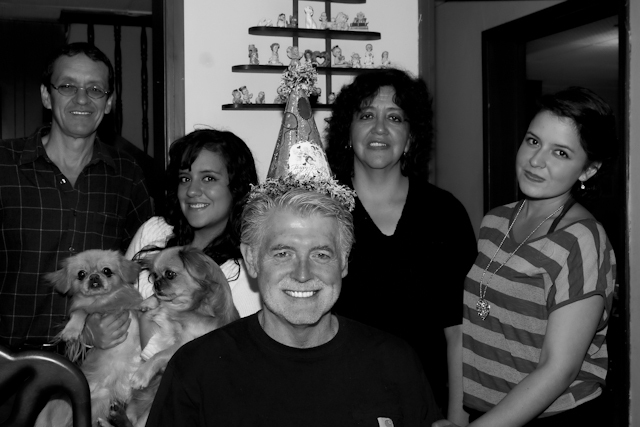 On Saturday, this loving family fixed a special meal to thank us and to honor Bo's birthday. We were so touched. 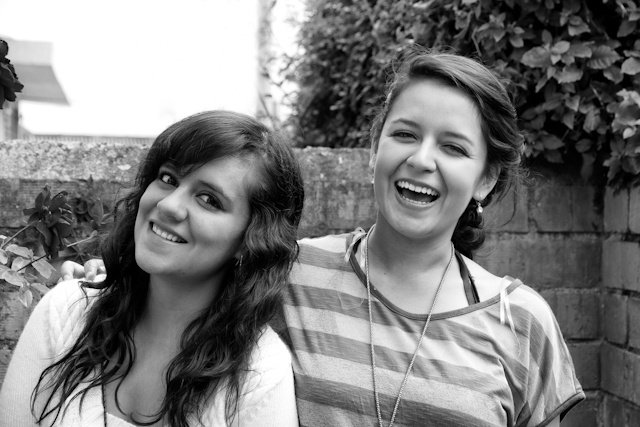 It was an afternoon of love, laughter, and delicious Ecuadorian food. We shared so much (Oh, how thankful I am that I can speak Spanish), and we ate too much. It is another special time here that we will remember fondly, and we know we will be sharing more wonderful times together apart from English lessons and exams. We're thankful to Sandra and Wayne for sharing this need and giving us the opportunity to be the ones to help this family. Because of it we now have new Ecuadorian friends who consider us family and we can look forward to more good times ahead. Jimena, Erika, Mari, and Pancho. We love them so much - and they love us!!! MOVING TO ECUADOR - PACKING FOR CUENCA! We arrived on Dec 5th, 2012 with two carry-ons each and two check-ins each. We use our backpacks daily for shopping trips to the Mercados and tiendas, and also to carry my photo gear when out on a city shoot. The two blue "High Sierra" backpack roller bags were my prize find at our local Good Will for $7 each! When I think about the process we went through of "Repacking Our Bags" before finally boarding that first flight leg of our long-planned-for trip and heading for Cuenca, we now know a few things we might have packed differently. 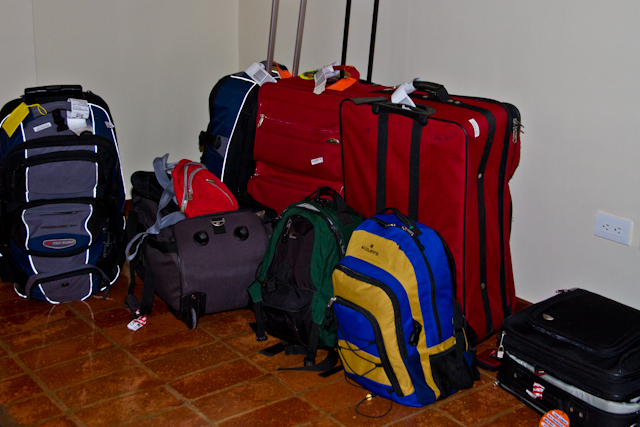 We came to Cuenca on December 5th 2012 with 4 check-on bags (2 each) and 4 carry-ons (2 each). For several months prior, I had researched in-depth specifically what to bring and what to leave behind reading different blogs and other ex-pats' opinions and experiences. I finally narrowed it down to what I thought would be critical for Bo and me to bring. Well, everyone's needs and wants are different!! Having never visited Ecuador or Cuenca, we both wanted to bring only what was absolutely necessary to begin our living experience here. Today I can say that we brought things we could have left behind that caused us unnecessary and wasted weight, and we left things we wish we had brought. 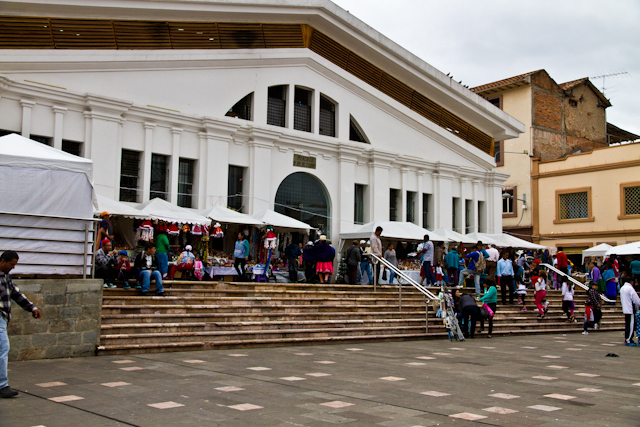 After three months here of daily shopping and discovery, and also visiting a well-equipped CORAL stores at Mall Del Rio (one of several in Cuenca and our Ecuadorian Walmart), I know we can find most anything we would need right here in Cuenca. Yes, maybe we can't find the name-brands we want. For example, I want to buy an original "Crock Pot" slow cooker (in my experience, others leak), and at CORAL I saw every other name brand except "Crock Pot." However, there are two stores in El Centro where they do sell the original CROCK POT brand! It costs a bit more here, but not enough to warrant bringing the one I have in the USA all the way to Cuenca. 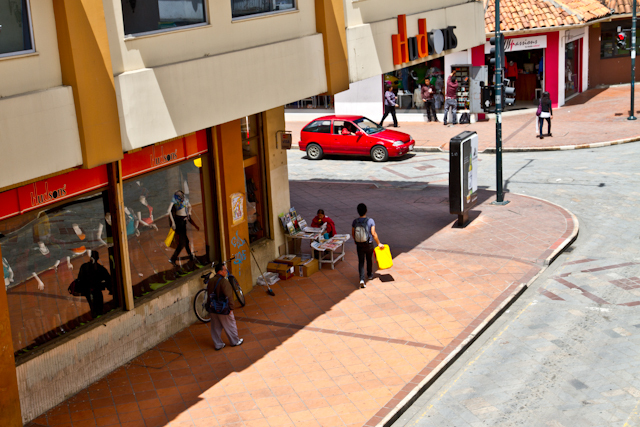 I KNOW I can find shampoo, makeup, clothes, cookware, and anything else I might need right here in Cuenca. 1 - Bose Speakers - At the airport, because our luggage was 50 lbs over weight, I pulled my awesome compact Bose speakers to reduce the weight. To this day, I am so sorry I didn't pull some other unnecessary weight (I was rushed, on overwhelm, and could not think since there was a line behind us and I had to eliminate weighty things fast!). Electronics here are spendy. I haven't found speakers here I want to spend that much money on, so my music is lacking that awesome sound. I'm a music audiophile, and every day I miss listening to my music in Bose stereo sound. 2 - Salad Spinner - I am yet to find a place that sells one. Any suggestions?? We eat a lot of salad greens, and I love dry-spinning my washed greens. That would have weighed nothing, but I had no clue that I would miss that simple kitchen gadget. Unless I find one here, it is one thing I will bring back with me when we return this summer to Oregon for a few things. 3 - Jewelry - In my research, I kept reading how much of a target I would be if I wore jewelry here. Well duh! Yeah, if you wear and flash real gold and diamonds and dress like a rich Gringa! My attire resembles nothing close to a rich Gringa. Makeup is minimal, and I dress like I'm on my way to the health club or ready to go hiking. I could have packed more of my beautiful fun costume jewelry to enjoy wearing here. My fun bling is something I miss when I want to dress up a bit. I can testify that Cuenca is a safe place if you are not flaunting that you have money! 4 - Skinny Clothes - My pants are falling off me (brag, brag)! Bo's too!! I had read about how much weight one loses here from the altitude and all the daily walking, plus eating more wholesomely. Well, this is all TRUE! Bo has lost about 25 lbs in three months. I don't have a clue what I've lost in weight (I'm not big! ), but I need new pants that fit! Back home, there are clothes in storage that would be perfect now, and the few clothes I did pack need to be replaced. I'm looking forward to our trip back to the states so I can bring back some favorite clothes that will now fit. Bo, will need to buy some skinny clothes this summer (he's still losing weight - woohoo!!! 5 - Kindle and/or Compact Tablet - I had researched and looked at Kindles before coming here. I also drooled over an iPad. But, because I didn't know what was best to buy or bring, we came here with our laptops. It would be so much more convenient to be able to download books on a kindle or to carry a compact lightweight tablet around. Again, electronics are more costly here, so coming in with these items would have been a good choice. Now we know what we will return with next trip back to the USA. 6 - Phones - Some of the things I read caused us to shy away from bringing better cell phones in. We are now the not-so-proud users of cheapy crappy phones we purchased here. A woman sitting on a park bench at Parque Calderon was intensely focused on her reading, and she laid her iPhone next to her. Our neighbors were sitting across from her, saw a teenage boy who was pretending to play in the bushes behind her leap over the fence, grab the phone, and run! These are the people who get robbed here! Bo is going to revert back to his more useful expensive smart phone, and I will buy and bring back an iPhone. We also would have brought in a regular phone for our MagicJack. I did not like having to go to Coral today to buy a phone when we have about 4 phones back home. 7 - Selective Kitchen Utensils (Sharp Potato Peeler, Wine Bottle Corkscrew Opener, Sharp Knives, Vegetable Steamer, Favorite Fry Pan and Stainless Steel Pot(s), Trader Joe's Pop-Up Sponges, etc) - Because we love to cook in a well-equipped kitchen, we had/have missed some things that we are spoiled about. However, once again, we should be able to eventually find these things here. Today we bought a great wine bottle opener at CORAL, finally!! However, when we first arrived here and rented several not-so-well-equipped apartments, we were struggling with dull knives, dull potato peelers, and crappy aluminum cookware and utensils. That's not all, but to keep this short and sweet, we would have brought some items that take no room in the suitcase so we could have had these from the beginning. With time and having moved into a nicely equipped apartment, we finally have a super sharp potato peeler and other things that make our kitchen times happy times. We love to cook most of our meals, so for us this is important. If you don't like to cook and instead plan to eat out most of the time, this is probably no big deal for you. But, for those who love to cook and eat in more often than out - having certain kitchen gadgets right away after arriving here makes a big difference. Having the right tools is important to us! 8 - Comfortable Shoes - I am a shoeaholic! There, I confessed it..... One of the most difficult things I had to let go of was my shoe collection. I remember loading up several large garbage bags of my beautiful shoes collection and driving them to the St. Vinny's prior to coming here. Well, I'm over it - really!! I would never even consider wearing those shoes on these uneven cobblestone and unpredictable streets of Cuenca. I did bring about 3 pairs of shoes that I will never wear here, and now I wish I had a few more of my earthy comfy shoes in their place. Bo and I walk everywhere. We walk for miles and miles. Bringing more practical and useful shoes is a must for me in the future. I LOVE walking around the city and outside the city - and I now LOVE dressing casually and comfortably. Bo too! He used to wear a Corporate costume every day. Now he wears his Cuenca casuals, and our dress life has become so much more simple. We like it that way! 1 - Laptops, Compact Color Photo Printer, Magic Jack Plus, Cameras, Lenses, Battery charger and Rechargeable Batteries, External Hard Drives, Video Camera, Tripod, Mono-pod, Docking Stations, Surge Protectors, CHARGERS, and other miscellaneous electronic gear - All of these things we packed in our carry-ons. We brought as much of our electronics as we could because we knew they would be way too costly here to replace, and they also didn't take much room to bring. Photography is my passion. I'm a photography gear junkie! Because I had read that it was not safe here (there you go again!!!) to bring in expensive gear, I wrote to an avid photographer who has been living in Cuenca for a couple years, and he encouraged me to bring everything or I'd regret it. I'm so glad I contacted him and heeded his advice! When I go out on my photo shoots, I wear my camera securely around my neck, carry my lenses in my sturdy backpack, and I pay attention to my surroundings (with Bo spotting me, of course). Last year, our USA home was robbed in the mid-afternoon, and I lost thousands of dollars of camera equipment and all of my jewelry (I'm finally over that too!!). I feel safer here in Cuenca than I did back home after that robbery. Again, using caution and wisdom anywhere helps - but we know that we can be violated and robbed no matter where we live in spite of this. 2 - VitaMix and Omega 8006 Juicer - HEAVY, Yes!!! Worth carrying on and bringing - Absolutely Yes!!! Our carry-on luggage was so HEAVY with all our electronics and mostly because of these two gems. Yet, these were things we were not going to check in because they were expensive, fragile, and we wanted to make sure they arrived with us securely and intact. We do have an Oster blender in our current apartment, but it ain't no VitaMix!!! I'm yet to see these two fabulous machines for sale here in Cuenca, and if they did or do have them they would cost. If you have these and truly use them, BRING THEM! You won't be sorry. Of course, those following our story know that the main part for my wonderful juicer cracked a month after being here (my fault - I assembled it incorrectly after washing it), and to this day, I can't juice. I then ordered the wrong part, and it took two months to arrive here via USA Casillero, a shipping service I was not happy with. Now I have a wrong part and have to start all over again. But, my Omega Juicer looks really nice on my kitchen counter (LOL). 3 - BackPacks and Sturdy Shopping Bags - We go to the mercados and tienditas daily. We pack lots of fresh meats, fruits and vegetables home and buy fresh eggs by the cubeta (tray of 30) which can get pretty heavy. So wearing our sturdy backpacks filled with large foldable lightweight compact heavy-duty canvas bags at all times makes lugging our groceries or anything else we purchase on our spur-of-the-moment regular shopping sprees easy for our short or longer walks home. 4 - Rain gear - Yes, it rains here! One of the reasons we left Eugene-Springfield, Oregon was because of the long eight months of continual rain (and I mean "slit-your-wrists" continual). We brought our raincoats and umbrellas here because we read that it can get quite cold in Cuenca and that it rains often here. Well, yes it rains, but not every day. When it does rain, it lasts a few minutes or hours depending on the season and then the warm beautiful sun shines again (Oh, we love the sun and blue skies here). Daily, when we go out, we pack our rain gear, plus we layer our clothes for the daily weather change that will creep up unexpectedly on us. We leave our apartment early with sweatshirts on, and by late morning or early afternoon it is t-shirt warm weather. Then it may get cloudy and rain by afternoon for a few, so out comes the rain gear and umbrella, and by early evening we have our sweatshirts back on. I LOVE the daily change of weather here and so does Bo. It's never humid, and certainly not too hot or cold or rainy for us (coming from rainy damp cold Oregon). The rain leaves the air clean and fresh and the landscape and flowers green and lush. Rain gear is a must here and we're glad we brought ours with us. 1 - Lotions, cosmetics, sunscreens, and most liquid products - These weigh! Weight is important to consider when packing. So many of the products I thought we couldn't find here that we brought we absolutely can find! I meticulously packed baggie after baggie filled with products that I now would never bring! How does one know though? Well, we didn't and so we packed so many unnecessary liquid products. 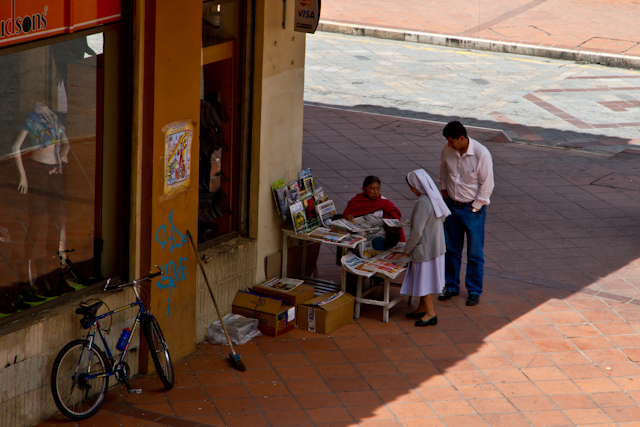 Since Bo and I had never visited Ecuador or Cuenca, we had no idea what to expect except for what we read from others living here. Again, every person's wants and needs will be different when packing. What's important to one may not be important to another. When I look back now, I can see that we could have come here for our first round of living with so much less, and we could have found those items in this well-stocked city. Some things are a bit more expensive, yes. However, traveling with less and more simply is a better choice for us. Now we know this. If we are cautious, aware, and discerning while living here, we can use the cell phones we like, wear the jewelry (bling, not expensive GOLD) we enjoy, and walk around this lovely city without the paranoid hype we often read about from people who have been violated because of their lack of wisdom and awareness. if we forgot to bring something, it is probably available for purchase here. This city is abundant with beautiful things. Yes, there are items that we currently own that are irreplaceable or way too expensive to purchase here. Those things may be a must to pack. Our desire to simplify our lives continues to be a letting-go-of process and on-going learning experience. Living here with so much less than we had in the states proves to be very liberating. We are yet to accumulate and clutter up our lives here in Cuenca with STUFF. Everything we need (not want) we have. We are certainly not lacking. If we had come with just two carry-ons each and one large suitcase, we would probably still have been just fine knowing that we would eventually be returning to the states with a better idea of what we would need to bring back. Packing is not the easiest task when one is moving out of country to an unknown city, having never been there before. It's an individual journey! This is our personal packing journey, and we share it to hopefully give those reading our BLOG some more food for thought. FINALLY, AT THE AIRPORT!! 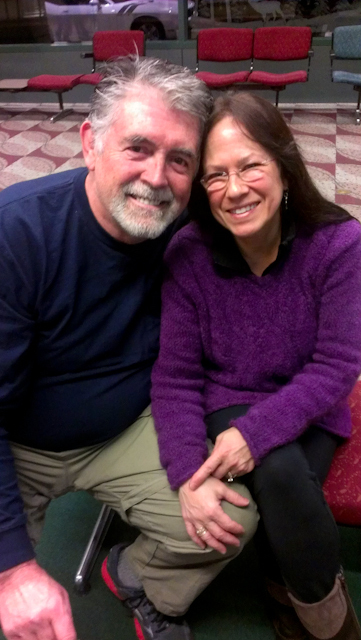 December 4th, 2012 - The day we left our hometown of 39 years - Eugene, Oregon! It seems like so long ago, and for now, Cuenca is our home.